Most people will agree that flat soda is just not as delicious or satisfying to drink as a bubbly soda. 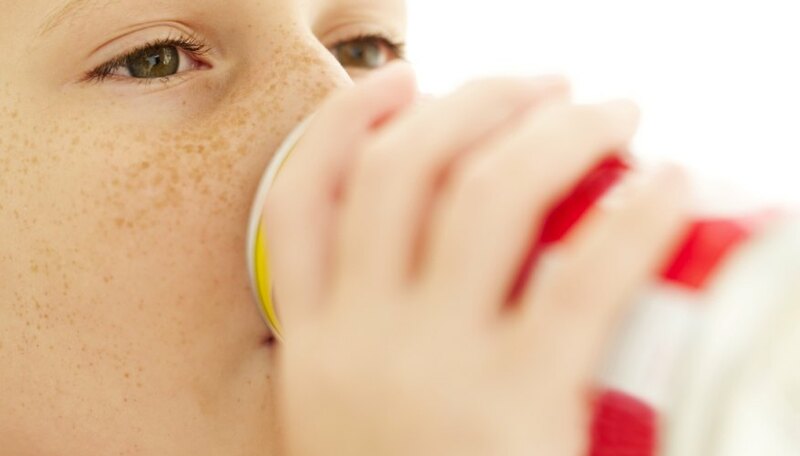 There are three main ingredients in all types of soda: water, sugar-flavored syrup and carbon dioxide gas, which is responsible for the fizziness. The gas in a bottle or can of soda is under pressure, which is why you hear the hiss of a few escaping bubbles when soda is opened. Varying brands and flavors of soda may have more carbonation than others. Easy science experiments can help you determine which soda has the most fizz. Having a sip is one way to test which soda has more fizz. Your tongue can feel the texture of the bubbles popping in your mouth, and your taste buds -- the kind that sense sourness -- can taste the carbonic acid. These taste buds also contain an enzyme called carbonic anhydrase, which reacts with the acid, leading to a popping sensation when drinking something fizzy. Conduct a taste experiment to find out which soda is more carbonated. Ensure that each soda bottle or can is covered in black paper, so that the test is blind. Open a new bottle or can for each taste to prevent the soda from becoming flat. Pour a sip into a cup. When the tester has tasted all the sodas, have her discreetly number them in order of most fizz on a piece of paper. Repeat the experiment with other testers. When you have at least five results, tally up the votes for the winning soda. For this "experiment" you will need small, round, hard mint candies and new, unopened bottles of different soda brands of exactly the same size to test. Dropping a round mint into the soda breaks the surface tension of the liquid, allowing carbon dioxide bubbles to suddenly escape. This creates a gush of soda that shoots out of the bottle. Perform the experiment one soda bottle at a time. Place the bottle in a deep bucket and cover it with a lid just as you drop in the candy, to contain all the liquid. Be sure the bottle does not tip over. While this activity shows the presence of carbon dioxide gas in a very fun way, it doesn't actually test which one has more fizz, since the presence of sticky sugar will inhibit the reaction, even if the soda has the same amount of fizz. Like other gases, carbon dioxide from soda can be used to blow balloons. Use new, unopened bottles of soda that are all the same size and contain the same volume of liquid. You will need a balloon for each bottle. Stretch out each balloon slightly by gently pulling it. Next, pour a teaspoon of salt into each balloon. Remove the cap from the first soda bottle and immediately place the balloon over the mouth of the bottle. Hold the balloon tightly in place, and use a rubber band to secure it. Lift the end of the balloon, so that the salt slides into the soda. As the salt dissolves, it will trigger the carbon gas in the soda to flow upward, blowing up the balloon. Gently wrap a tape measure around the middle of the balloon to measure its circumference. Repeat the experiment with each bottle of soda. The soda that produces the largest balloon contains the most carbon dioxide and therefore the most fizz. This experiment uses the gas from a bottle of soda to push water upward in a tall jar. Mark the jar with a ruler so that the water displacement can be measured. Fill a large glass bowl with water and place the jar upside down in it. The jar should not fill more than halfway with water from the bowl. Mark this water level with a marker. Next, cut a small hole into a soda bottle lid and place one end of a long, flexible plastic tube into the lid. Make an air-tight seal using vaseline. Insert the other end into the mouth of the inverted jar. Set a timer to 30 seconds. Remove the lid of a new bottle of soda and quickly replace it with the lid with the tubing in it. Now the fun part. Shake the bottle to get the carbon dioxide to move down the tubing and into the jar. As it does so, it will make the water in the jar bubble upward. Continue shaking for the full 30 seconds, and record how much the water rises in the jar. Repeat the experiment with each bottle of soda. The one that displaces the most water in the jar to get the highest reading, has the most fizz. Popular Science: FYI - Why Do Humans Like Fizzy Drinks? Lansing State Journal: How Is Soda Pop Carbonated? Oregon State University College of Engineering: The Fizz Factor - Which Soda Has the Most Pop?